Polling division voting data are available for the most recent Canadian federal election, as are some geographic boundary files for the 2011 and upcoming 2015 election (the latter of which were formed in 2013). Much has been written about how the new election boundaries may favour one party or another, particularly in Ontario. The balance of opinion is that the Conservatives will win more of the new districts than the Liberals or NDP. Within this context, I am going to explore the new electoral boundaries in the Hamilton area, and make some guesses about how the new districts could impact the upcoming 2015 election. On the first figure you can see the old boundaries (black lines) as well as the new boundaries (shaded with red boundaries). The area covers both Hamilton and the rural areas to the west, south and east. 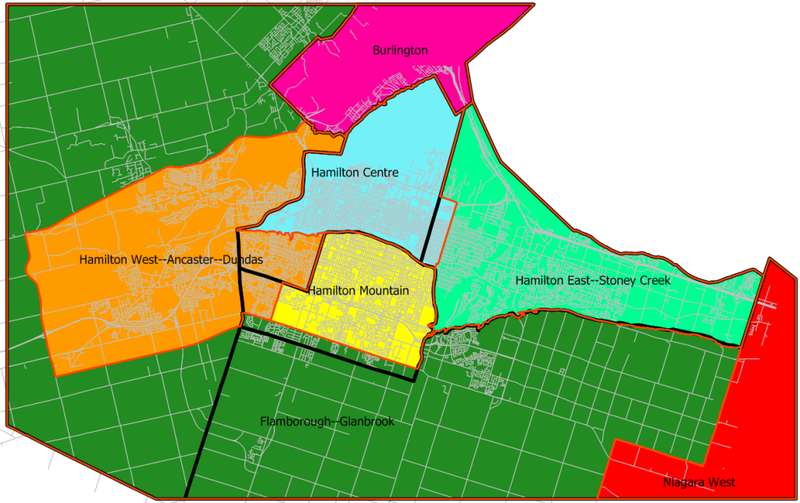 Except for Burlington and Niagara-West, each of these ridings covers at least some part of the official Hamilton city boundary. The analysis focusses on the area covering the five ridings that are at least partly within the city proper. The biggest qualitative change is in West Hamilton, with the creation of a largely urban district (Hamilton West-Ancaster-Dundas) out of what was an urban/rural mixed district that included West Hamilton, Dundas, Ancaster and the largely rural Flamborough area to the west. This new district includes more of Hamilton proper (a section of West Mountain), and excludes the rural areas. Furthermore, the rural areas to the west and south have been joined into their own new district of Flamborough-Glanbrook, which is largely rural. In the table below I tabulate the 2011 voting data by the 2011 and 2015 FEDs. The table excludes data from advanced polls and other voters that can’t be directly linked to polling division data. As a result, the numbers underestimate the total number of votes for all parties by 10 and 15% depending on the riding and the party (for example, there is likely more underestimation for the Conservatives than for the NDP since Conservative voters are more likely to use advanced voting). Part of the challenge with comparing election results this way is that there is overlap between the ridings. At first glance it would appear that there is no change at all in the total seats available, but that’s only because the focus here is on ridings that include at least part of the city of Hamilton based on the new federal boundaries. If we were to have focussed on a larger area that included rural and urban areas to the south and east of Hamilton, there has been a net increase of one riding in the southern part of the Golden Horseshoe. As far as the effect on future election results, the largest impact on re-districting could be that it gives the NDP and the Liberals a chance to pick up the new Hamilton West-Ancaster-Dundas (HWAD) riding, particularly because there is no incumbent candidate. David Sweet, who was the incumbent for the former Ancaster-Dundas-Flamborough-Westdale riding, is running in the Flamborough-Glanbrook riding for the 2015 election. Without an incumbent in HWAD, the conservative support is probably weaker than the table above suggests. Based on some recently modelling I’ve done (I’ll post the results in the near future) the absence of an incumbent could knock down the Conservative vote by 20 to 30%. Assuming that those lost votes would lean more Liberal than NDP, it could make the riding a tight three way race where the deciding factor is likely to be the groundwork and profile of the candidates themselves. As of February 24, 2015, the Conservatives and Liberals have nominated candidates for the HWAD riding, but the NDP have not. This entry was posted in Uncategorized on February 24, 2015 by Niko Yiannakoulias.